Zoulah was peeking in the Women's Day Magazine the other day and she saw these spheres. She featured them in her Candy Corn Tablescape this week. Zoulah wants to tell you that they are so easy to make. It took Zoolah about 30 minutes to make each sphere. They provide an extra punch of color during the Halloween season. 2 Large bags of candy corn (26 ounce) per sphere -- You won't use all of it. Candle holders or urns or anything to display the spheres. Zoulah found her candle holders at a garage sale. Toothpicks to pick out stray hot glue threads. Take your sphere and position it on top of a small bowl; Zoulah used a ramekin. 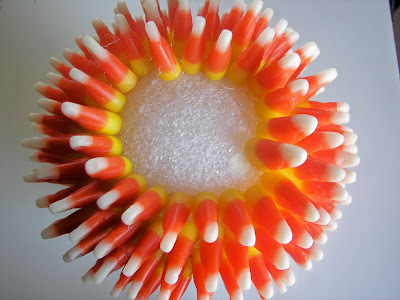 Begin gluing candy corns on the sphere in a circle around the sphere horizontally; make sure that you do not leave any space inbetween the candy corns. When you start the next row, try to position the first candy corn in the row inbetween two of the candy corns from the first row --- brick laying fashion. Now, Zoulah wants to caution you to not be a perfectionist on this. If the row of candy corns is not straight that's okay. Zoulah found that you should apply hot glue to the bottom of each candy corn and not run a row of glue on the styrofoam sphere. By gluing each sphere, you will get less of the hot glue threads. Use a toothpick to remove any stray glue threads. 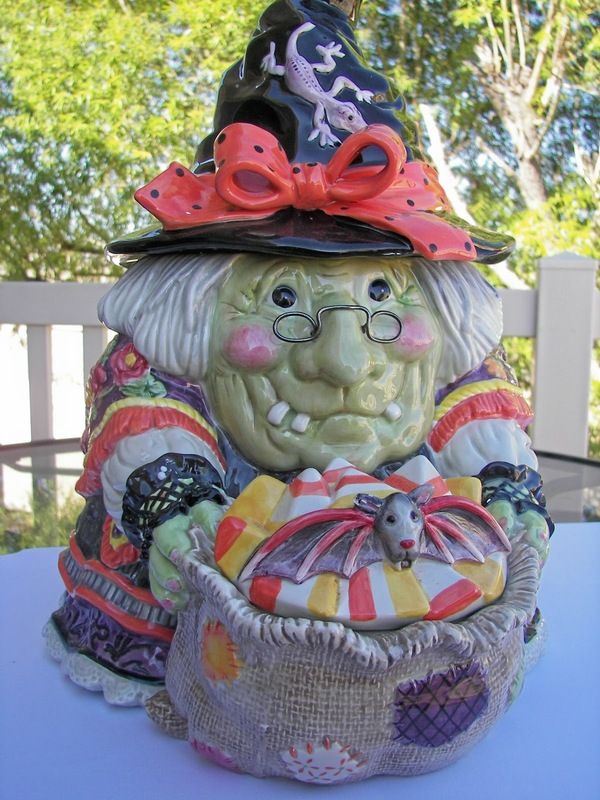 When finished, place on candy holder or on top of the opening of an urn. Zoulah thanks you for dropping by her Halloween Bash at Red Couch Recipes where she always has more tricks and treats this Halloween season. What a nifty idea! I think I am going to have a hard time finding candy corn over here, though, as Halloween is only just now starting to become popular. 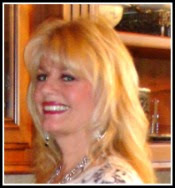 I love your Halloween background-it is so cute! TOo cute...just came over from Tidy Mom! 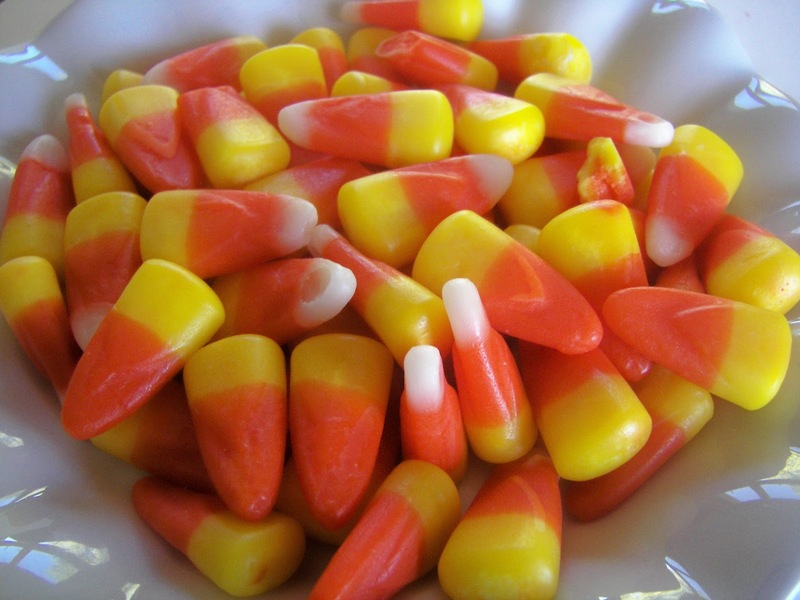 Candy corn is a sure sign that fall is here! 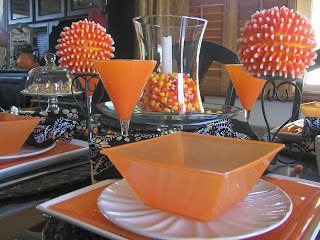 I love those candy corn orbs...I just may have to break down and give them a try. Thanks, Zoulah - you should have your own webpage! Joni, I'm going to make this for sure! So cute! This looks so festive! I am inspired! Tell Zoulah thanks for the tutorial. I love the candy corn spheres. 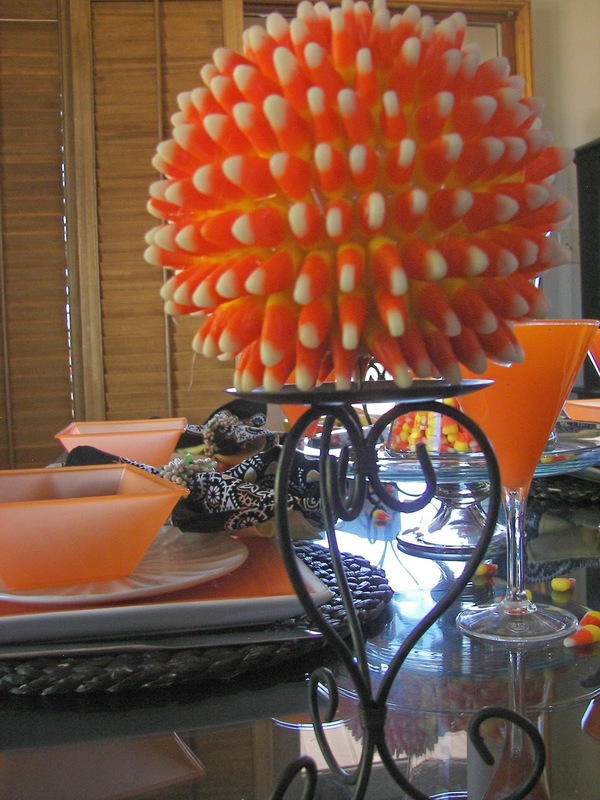 Hate candy corn but love the cute look so now I can have my candy corn but I don't have to eat it. So cute. These look so precision and festive! Love the look! These are on my to-do list this week. They are just adorable and colorful! Thanks so much. These are awesome! What a great centerpiece. Glad you showed how to do these. I love the color. I went shopping for candy corn for the houses and only got dull colors, what's up with that? Yours just jump off the page. I am trying to sneak out of here without stealing your vintage side bars!Ahhhhhhhh! Where did you find all of this wonderfulness? Beautiful! Need more candy corn, off to the store! OMG I know there is at least 20 of these images that I haven't seen! Ahhhhhhh! I am a Hallo-vintage junkie. Too much fun...what a great decoration...love it! How perfect - like a candy sea urchin. I have two words for this one, LOVE IT! 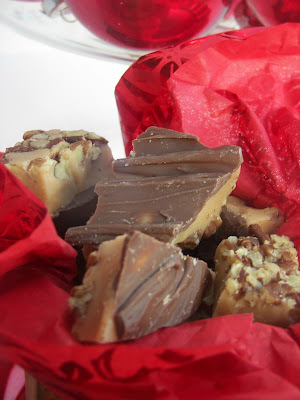 I am so making these, I absolutlely LOVE them! Thanks for joining my linky party! TOO CUTE!! What a wonderfully unique idea! Super cute! Great way to add a pop of color! I love this - I may need to make it to match my candy corn wreath! Oh my this is adorable and I can't wait to decorate my table with this sphere, thanks for sharing! !